Shoulder pads...which I wish they would have put to the side wit the football. Throws off the look. The helmet is a nod to the original, it looks ridiculous, but it has a reason to. Great likeness. I’d get him if there was a sports line to go along with him. Sort of like Jimi Hendrix. very interesting ,i didnt want the "14" one ,but this one is very nice ,i hope this is what they have in mind for ali . The helmet itself is just...too cheap looking. In an era where McFarlane Sportspicks have authentic detail, something that looks like a gumball machine prize, while possessing vintage charm, just comes off as cheap, even if it is a nod to a vintage toy. 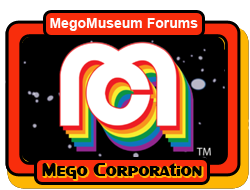 Mego should be balancing nostalgia and innovation. At least in my opinion. If they want to move forward, they should work on likenesses, and accuracy. Kitschy charm will only get them so far when there's stuff like NECA on the pegs. Even if they just tooled the helmet to be very similar to the ones that came with the old NFL Action Team Mates, that would be a huge improvement. In saying that, I’m not really concerned with this specifically, unless, by some miracle, Mego does decide (or is able to) to revive the old NFL Team Mates line. Cool! I hope the Sports line also includes Howard Cosell and Ali. Ali was confirmed by Marty months ago. It's happening. He looks great! Well outfitted/accessorized.